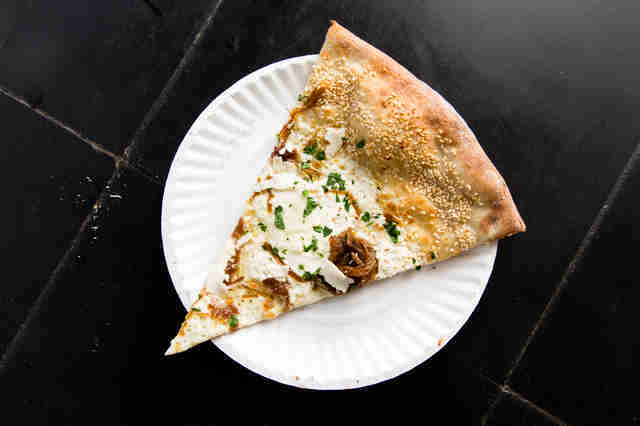 New York City has the best pizza in the country. This is not a boast or a bluster, but rather an established fact. Let other cities squabble over second and third place; we maintain the quiet confidence of a king. And while Manhattan has reigned over our oven-baked empire for generations, Brooklyn is the heir apparent. We hereby decree these to be the thinnest, thickest, crispiest, chewiest, cheesiest, meatiest, veganist, most delicious pizzas in the county of Kings. Housed in a former auto body shop and named for a champion racehorse, Speedy Romeo’s slings wood-fired pies in the Italian style by way of St. Louis. 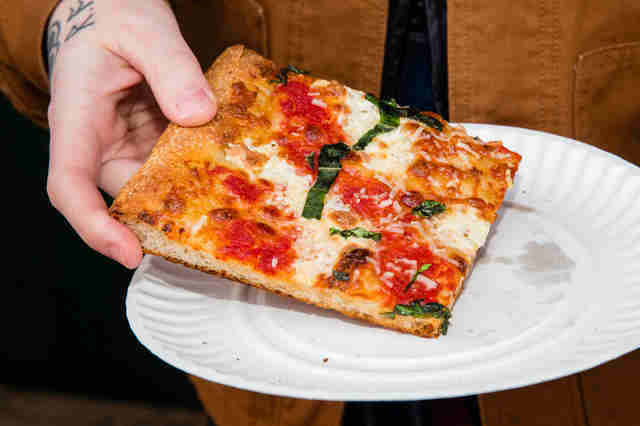 These are thinner, with a drier, crispier crust, than the typical Brooklyn pizza. The St. Louie nods to its namesake, topped with the city’s beloved Provel cheese -- a processed, sticky blend of Cheddar, provolone, and Swiss -- while margherita and marinara options skew more traditional. The quality dollar slice is practically extinct, but the maestros at Vinnie’s keep the prices as close to that magic number as possible. 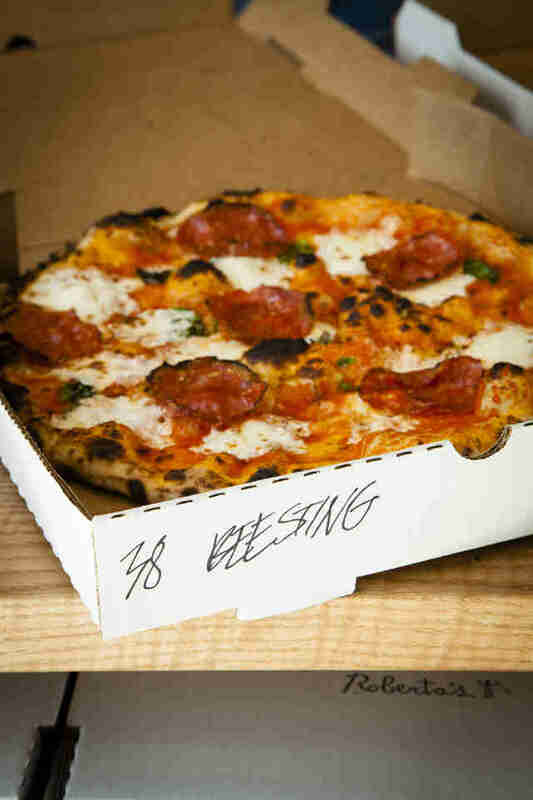 Neither spot looks like much -- each location’s tiny interior is tucked beneath a worn, sparingly designed awning -- but the pizza rivals any of its pricier counterparts. 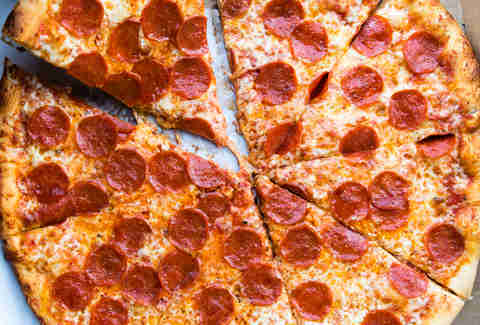 Cheese and pepperoni classics shine, and you can comb a roster of vegan and gluten-free options as well. 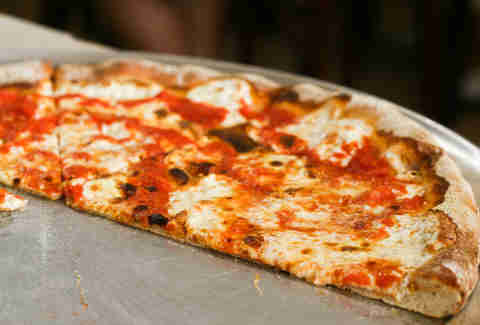 Crackly, thin-crust pizzas are the specialty at the legendary Totonno’s, a treasure of Coney Island since 1924. After learning from the best at Lombardi’s, Anthony Pero opened up shop on Neptune Avenue, making pizzas in the now-rare coal-fired brick oven (most don’t pass current environmental laws). 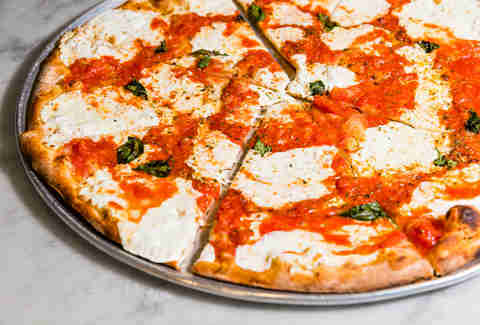 People make the pilgrimage from across the five boroughs and around the world to get a taste of the beloved margherita pizza: a blackened, crisp crust piled with mounds of slightly sweet tomato sauce and rounds of mozzarella that bubble and brown in the oven. Relatively new to the Brooklyn Heights Historic District, Dellarocco’s is a cozy neighborhood gem, drawing more locals than nearby tourist destination Grimaldi’s. The shop further sets itself apart with a slew of white pies -- 14 in all. Go ahead and eschew their red sauce options and order Dellarocco’s eponymous pizza: puffy dough layered with smoked buffalo mozzarella, broccoli rabe, sausage, red pepper, garlic, and basil. Operated by the same family behind Carroll Gardens’ perennial favorite Lucali, Giuseppina’s tosses crisp-yet-pliant brick-oven pizzas at this South Brooklyn joint. The pies here are just as good as anything you’ll order at the fam’s first spot, with shorter wait times, a wine and beer menu, and a reduced chance of being stabbed. 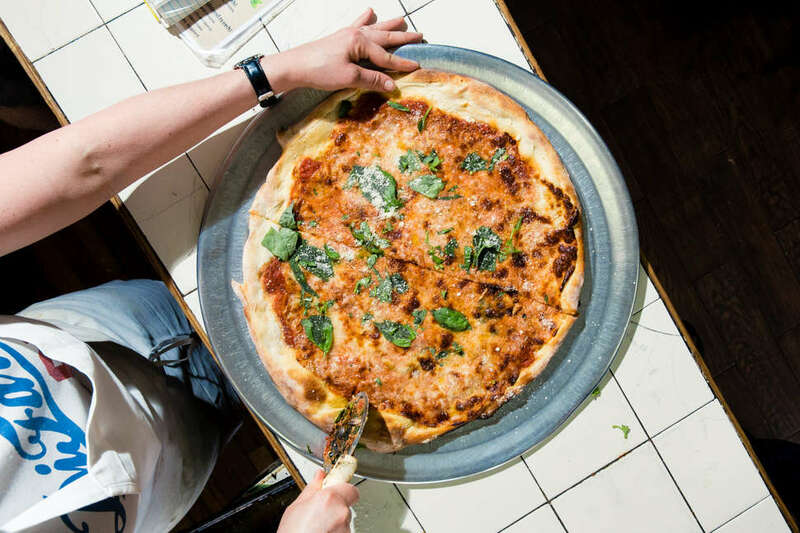 Sister shop to Williamsburg’s Emmy Squared, this Clinton Hill favorite helps feed Brooklyn’s pizza addiction. The thin-yet-doughy new-school round pies are divided into four categories -- the reds, the whites, the greens, and the pinks -- and delivered to your table on a steel tray. The red sauce Colony (mozzarella, pepperoni, pickled jalapeño, and honey) blends sharp heat with sweetness, and the tomatillo-topped El Pastor is topped with mozzarella, bacon, and chipotle pineapple. 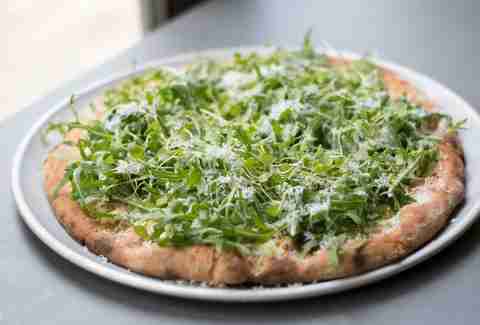 Gristmill boasts an eccentric, seasonally evolving menu of smoked salmon, acorn-fed pork sandwiches, and dry-aged beef burgers, but it’s the pizza that draws the stroller-pushing Park Slope families. 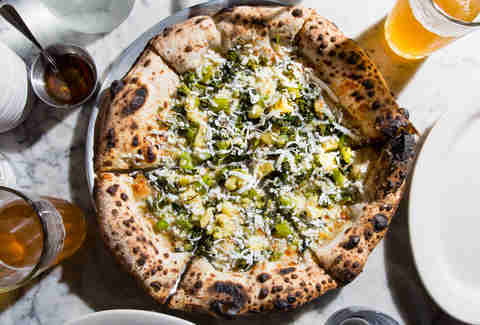 Wood-fired pies come with unusual toppings (think crispy kale, mozzarella, and jalapeño vinegar), and the dough is unique, too: freshly milled, whole grain flour is combined with a sourdough starter, creating a dark, dense, tangy crust. Not in the mood for an entire pie? Grandma slices are served during brunch, lunch, and dinner, in mushroom and cheese & pepperoni varieties. 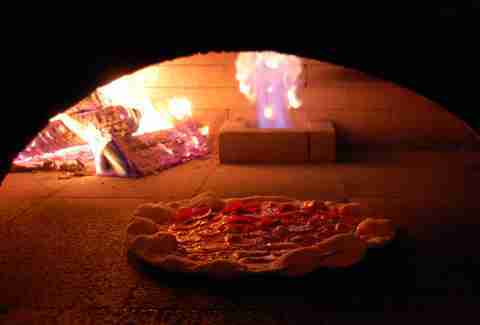 This snug space is always warm, heated by the open kitchen’s glowing, blue-tile-covered pizza oven. The service is almost excessively unrushed, but generous wine pours and tasty, seasonally rotating cocktails make up for the glacial pace. The popular square pie, crispy and blackened on the bottom, is simply covered in tomato sauce, mozzarella, olives, and basil florets. If you prefer a round pie, go for the light and airy Juno (broccoli rabe, potatoes, provola, ricotta salata) or the Cicero (hunks of onions, preserved tomatoes, provolone, mozzarella). 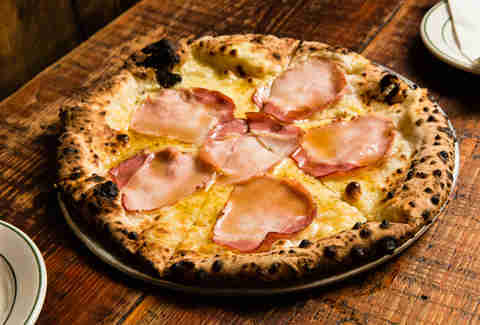 Tucked beneath elevated subway tracks in a landscape of industrial supply stores and tire shops, Neapolitan pizzeria Santa Panza amplifies every bit of its distance from Naples. 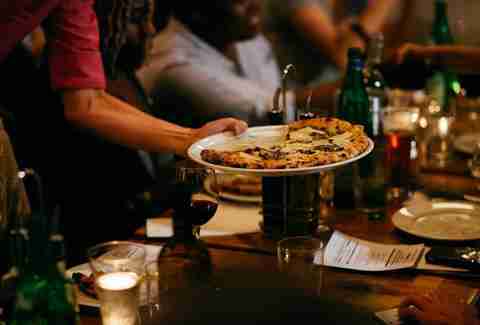 The space is small, with only a few tables and mismatched folding chairs, and the wood-burning oven in back corner emits a potent aroma of dough and olive oil. 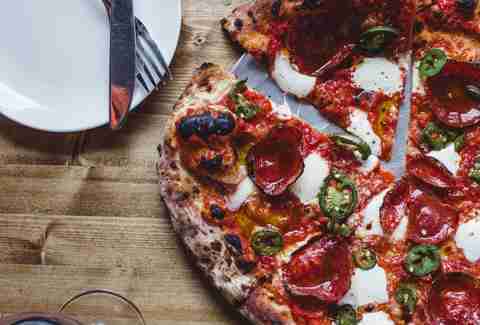 Pizzas come in 6- or 12-inch varieties, the former affording the opportunity to try a few. 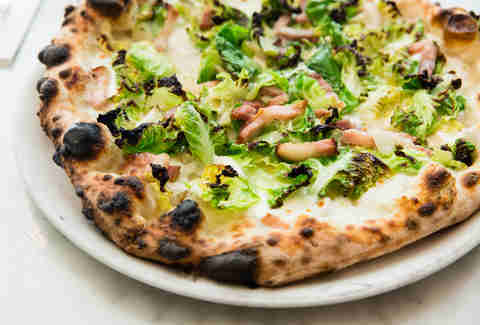 Selections from the rotating pizza specials -- with toppings like fontina, shaved Brussels sprouts, and curled, crisp rounds of porchetta -- stand out. You can order the coal-fired pies at this Grimaldi’s offshoot covered in any combination of housemade meatballs, prosciutto, anchovies, garlic, ricotta, and sausage -- and if you're intimidated by all the topping options (topptions? 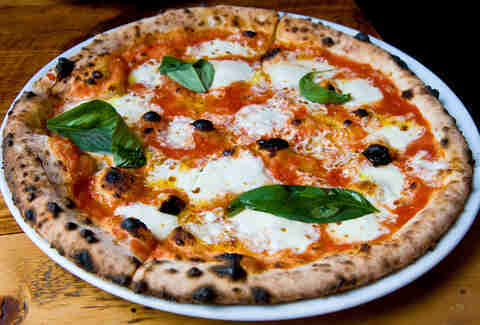 ), keeping it simple with the margherita is always a win. This isn’t the place to order a plain cheese slice: pile the buttery and slightly charred crust sky high with toppings like the chef’s signature fior di latte, spicy sausage, smoked pancetta, clams, and Brussels sprouts. Maybe not all at once, though -- unless you feel like being the greatest. Meanwhile, this is the place to order a plain cheese slice, especially if it's of the white pizza variety. 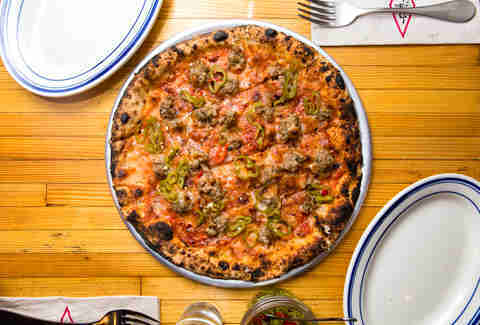 Of course, if you're open to the idea of toppings (and you should be), you can adorn your cheesy slice (or pie) with bacon, sausage, pickled veggies, and Calabrian chili. One of the best things about this place is, since they're on the lighter, crispier side, you can eat an entire pizza and not feel too upset about it. And thanks to combos like artichoke and pancetta, cremini and fennel sausage, and sopressata picante with honey, you definitely will eat an entire pizza by yourself. 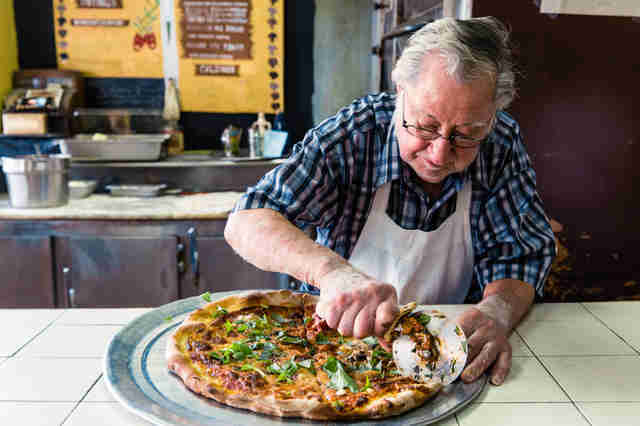 Yes, you’ve been hearing about this no-frills place on Avenue J forever, and yes, the line to get inside is borderline outrageous, but Di Fara's been turning out insanely delicious pies and slices for more than half a century, both round and square, and the quality's remained unchanged. If you still need convincing, consider this: Anthony Bourdain, the anti-Fieri himself, proclaimed this Midwood spot to be "the best of the best." Buddy the Elf can leave his maple syrup stash at home, because the Canadian-bacon and Gouda-covered Monte Cristo pie here comes with a drizzle of the sweet & sticky stuff on top. If that's a little too out-there for you, there's always the Arugula Shmoogula, the Ricotta Be Kiddin' Me, or the Hellboy -- that last one's not a pun, it's just a really good classic pizza. The hardest decision you'll make here is whether to go with a Round or Grandma crust (we’ll help you out: go Grandma). After that, the rest is gravy -- or Gorgonzola, soppressata, truffle oil, or any of the other specialty toppings on offer, all of which come with a drone delivery option, by the way. Welcome to the future. 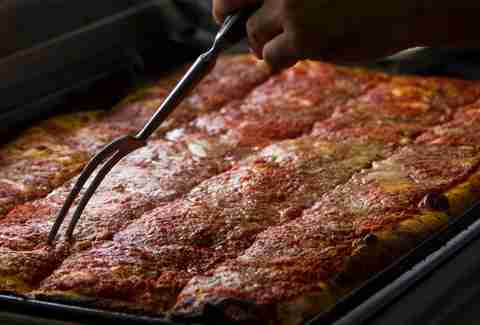 It’s a little out of the way -- like, "several stops and a subway transfer" out of the way -- but this Bensonhurst icon serves the epitome of what a Sicilian pizza should be. You can order by the slice or by the tray, and while it’s definitely a “would you like some cheese with your sauce” situation, don’t let that intimidate you: if you don’t get it all over your face, you’re doing it wrong. Sure, it’s not much to look at from the outside, but the backyard charm and communal tables at this legendary spot almost make its punny-named pies (like the Lil’ Stinker and Speckenwolf) taste better. Not that they have to, though, because said pies are covered in killer toppings like pork sausage, smoked mozzarella, and speck. This is the pizza equivalent of Painting With a Twist: you get a blank canvas (in this case, the pizza) and you “paint” it yourself by picking from a range of rotating toppings. Also, it’s BYOB and you’ll probably leave with a stained shirt. See? It’s totally the same... except you end up with an edible masterpiece at the end, instead of a warped piece of outsider art. Liz Newman is a freelance writer for Thrillist and will buy you a slice from one of these fine establishments if you don’t tell anyone she did Painting With a Twist. Follow her on Twitter and Instagram at @lizn813. Amy Schulman is an Editorial Assistant at Thrillist who swears by Di Fara’s basil-cutting technique. Follow her on Instagram.